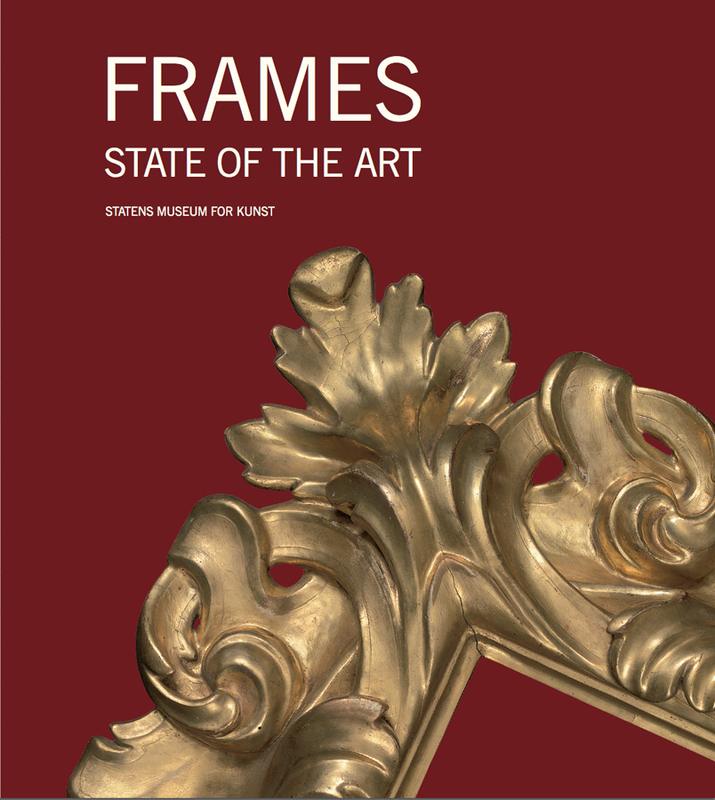 The book, Frames: state of the art (Rammens kunst), was published in 2008 to accompany the exhibition of the same name at the Statens Museum for Kunst in Copenhagen in 2009. The guiding spirit behind both was Henrik Bjerre, Head Conservator & head of the Jørn Rubow Centre for Conservation at the Museum for over 40 years. He is generously allowing The Frame Blog to republish essays from the book; these will appear as an occasional series. The first piece in the series is part of an essay by the Spanish philosopher, José Ortega y Gasset, first published in 1921, and known in some translations as ‘Meditations on the frame’. A painting lives its life surrounded by a frame. This close connection between painting and frame is by no means accidental. They are mutually dependent. A painting without a frame leads one’s thoughts to a man who has been robbed and stripped. Its content overflows the edges of the canvas and dissolves in the surrounding reality. On the other hand, the frame demands to have a painting inside it, and if it does not, then the section of the world one sees through the empty frame often appears as a painting in itself. The relationship between frame and painting is quite indissoluble, then, and far from being accidental; it has the nature of being a physical law, just as the neurological system is dependent on the cardiovascular and vice versa. As thought presupposes material, and the latter cannot function without the former. One could be tempted to think that the relationship between painting and frame corresponds to the body’s relationship to clothes. This would, however, be a misunderstanding. 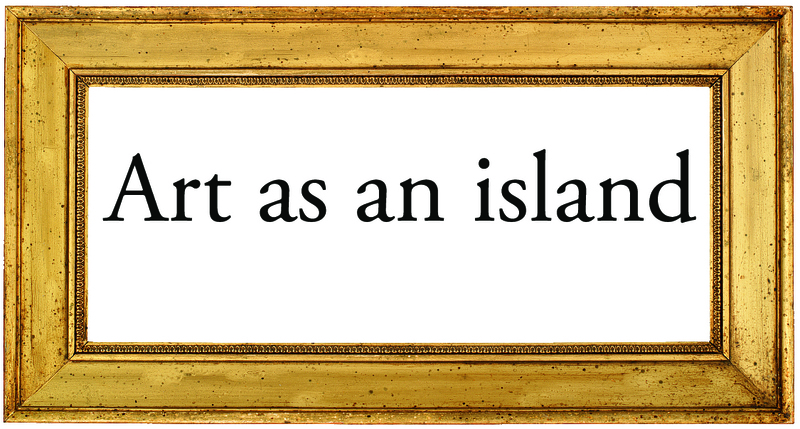 The frame is not the painting’s clothing, for, unlike clothing, which covers the body, the frame has the property of supporting the painting. It is true that sometimes clothing leaves parts of the body uncovered; but this appears to us often to be in sheer defiance, a rebellion by clothing itself, a sort of denial of its real purpose, a sin. If the part of the body which is not covered by clothes becomes larger than the part that is, the clothing ceases to be garments and instead becomes decoration, pure ornament. The naked Indian’s band around his waist is thus not part of a garment but has an exclusively ornamental nature. However, we cannot regard the frame as decoration and ornamentation for the painting, either. Man’s very first artistic efforts were to decorate his own body. The seed of all art which was to follow lies in these primitive decorations. Two or more of nature’s own works, which nature had not itself united, were conjoined in these very first works of art. Man fixed a bird’s feather on his head, the teeth of beasts of prey were hung on a chain round his neck, and he tied a bracelet of shining stones around his wrist. These were the first expressions in the enigmatic and complex language of art. What inscrutable instinct made the Indian adorn his head, then, with a colourful feather? Undoubtedly it was a question of drawing attention to himself, to mark a difference from others and a superiority. Biology has shown us that the need to show off and dominate is even stronger than the urge to look for food and shelter. This innovative Indian had an indefinable idea deep inside him that he was worth more than the others, he was more of a man than them; he fired off his whistling arrows through the dense forest with great precision and hit the most beautiful and shyest birds. The consciousness of his own superiority slumbered quietly within him. When he affixed the bird’s feather to his head, he gave body and life to his picture of himself. The feather was not just for the others to admire it, it was more a sort of lightning conductor which could attract the eyes of others and lead them on to his person. The feather was like an accent on a letter, and the accent accentuates the letter beneath it – and not itself in any way. The feather accentuates, emphasizes the Indian’s head and body, it floats colourfully over him and shines out in all directions. The same is true of all other sorts of ornamentation as it is with the Indian’s feather: they attract attention, but only to lead it on to the ornamented object. The frame, on the other hand, does not in itself attract attention. This can be proved quite easily. Try to think of the paintings you know best, and you will discover that you cannot remember how they are framed. The only place we look at the frame for its own sake is at the framemaker’s; that is, when it does not carry out its function as a frame. The frame in itself does not draw the eye; it concentrates the gaze and allows itself to gather on the painting. This is not, however, its primary capacity. The work of art is like an imaginary floating island, surrounded by reality on all sides. So it is decisive that it remains isolated from the life going on around it. We cannot move gradually between the physical and the painted world. Besides, we would not get the same aesthetic benefit at all from the work if the borders between art and the world around were erased. A painting without a frame loses its beauty and persuasive power if its borders merge with the concrete reality around it, with its demands and expectations of usefulness. If we want to get the most out of art, we have to move directly from the concrete reality of the wall to the imaginary universe of the work of art. There has to be a divider. This divider is the frame. If you want to divide something off from something else, you need a third thing which does not remind you of either of these two. A neutral object. The frame is not a necessary part of the building, like the wall; nor is it the enchanted surface of the canvas. The frame serves to neutralize a little part of the wall and lead our eye on from this to the other dimension, to the imaginary island. So the frame is a sort of window, in the same way as windows also behave as frames. The painting opens up for an idealized piece of the world in the middle of the silent reality of the wall, and we lean forward as if towards a window and regard this unreal scenario. In a similar way, a portion of a city or landscape seen through a window opening also often comes to look like a detached fragment without connection to the concrete world, just like a painting. 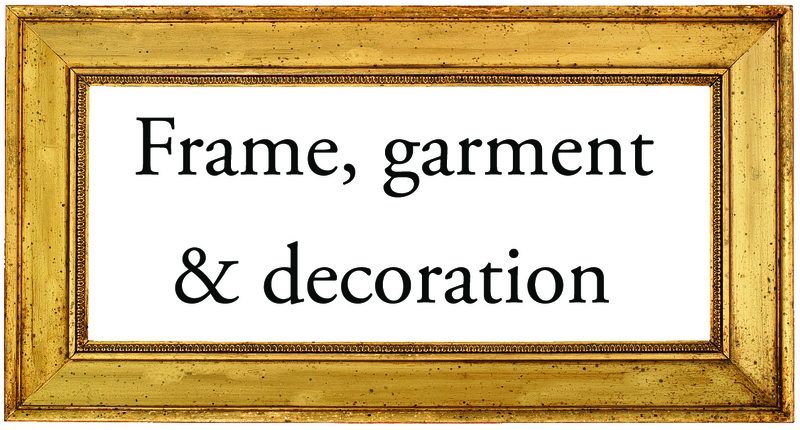 The gold frame has been preferred over the centuries to all other sorts of frame. 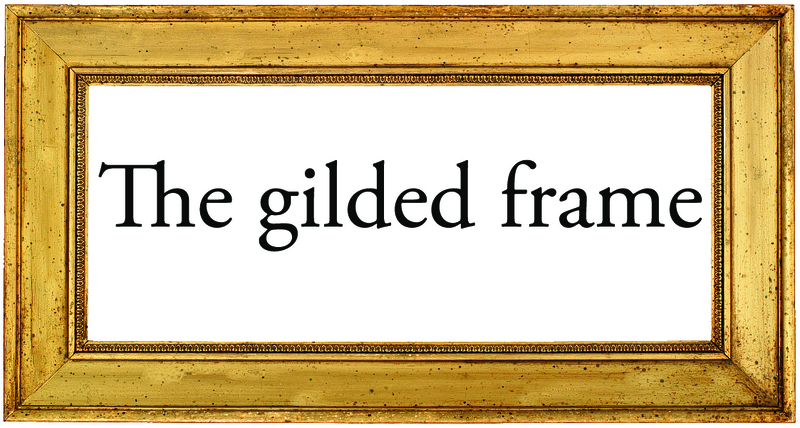 The above interpretation of the function of the frame helps to explain the privileged status of the gold frame. If the purpose is to take us away from empirical reality, the frame must appear to be as little recognizable as possible in relation to the nature which surrounds us. No matter how stylized the frame is, it will always lead our thoughts to the materials it has been made of. Even the cleanest and most geometrical ornamentation, convolutions and spiral decoration, will remind us of nature’s own forms, in the same way as the shell, picked up a thousand years ago, will still give echoes of the seething waves of the Atlantic. Only that which has no form is free of any sort of reference to reality. It is possible that the special status of the gold frame is due to the fact that the purple bronze used for gilding is the material that most reflects light, and reflections of light are not things in themselves but just light, pure colour without form. If an object is made of metal or glass, we will not focus on the light and reflections in the same way, but on the contrary, on the surface of the object itself. The reflection of light belongs neither to what is reflected nor to what it is reflected by, rather to the immaterial spectrum in between. As it neither has its own form nor is reproduced by the form of others, we are unable to see it as a concrete object and we are left in a strange uncertainty. With its powerful refulgence, the gold frame draws a glittering line between the painting and the reality around it. Its reflections of light are like knives that continually cut the ties we tend to want to make between the unreality of the work and the concrete reality of the surroundings. Quite in the same way as the gate to Paradise, where an angel meets the new arrival with a burning sword, a sword of reflections of light. 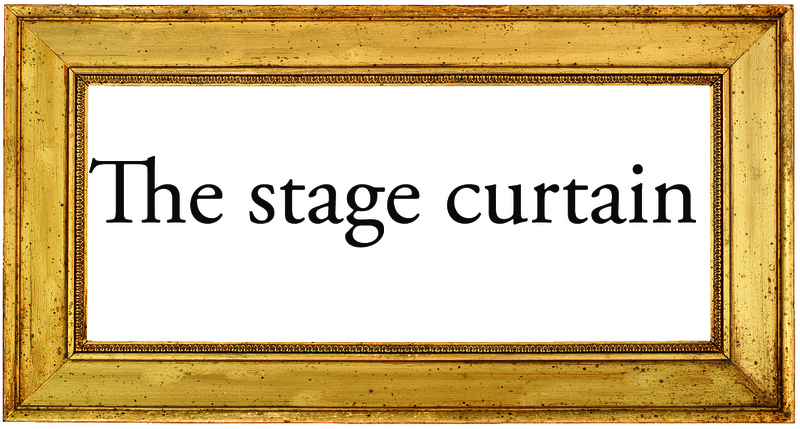 The stage curtain is the frame of the theatre stage. It hangs heavy and significant, like brackets surrounding other content than what is to be found in the rest of the room. The less ornamentation it has, the better. It tells us with a grandiose and absurd gesture that another world begins on the imaginary hinterland of the stage, an unreal world, a phantasmagoria. We would not allow it if the stage curtain opened its mouth to speak about business and daily life, that it just repeated what the audience have already brought into the theatre with them. We expect to be met by a puff of fantasy, a breath of legend and unreality. One cannot ever get to the bottom of this subject, and our attempts to write the definitive work on the frame must necessarily end in failure. We have to stop while we can. Of course we could begin to talk about the hat and veil as a frame around a woman’s face. Here we have to give up. It would also be fitting to discuss why Chinese and Japanese paintings are not normally framed. But why should we start on that discussion, which in its essence is about the difference between Western and Far Eastern art, between the Asian and the European soul? To understand these differences, we would first have to investigate why the Chinese orient themselves towards the south and not the north. Why people wear white in China to show sorrow. Why they start with the roof and not the foundation when they build a house. And why people in China move their heads up and down when they want to say no, just like us when we want to say yes. With grateful thanks to Henrik Bjerre for permission to republish articles in Frames: state of the art, and to Sven Bjerkhof and Poul Lauritsen for facilitating the process. I am very sorry I didn’t get to teach at West Coast Art & Frame Expo in Las Vegas this year so that I could have been there to meet you in person as well as hoot and holler during your presentation. I hope all went well for you. Regarding this 2008 catalog, I’m still without one, have no leads to a copy for sale or to read through inter-library loan, and still have burning desire for either. As for the Gasset essay, this translation is slightly different from the one by Andrea L. Bell as published in The Art of the Edge: European Frames 1300-1900, the 1986 exhibition catalog published by The Art Institute of Chicago. I hadn’t compared them four years ago when communicating with you about it. Winter has been an easy one this year here in my great American West. Hope yours has been, too. UPDATE: Fingers crossed, but I’ve just received confirmation on my order from a seller in Sweden for this book at a reasonable price and shipping costs. It should be here within a month. 2nd UPDATE: Book in hand. BINGO!!!! I am very excited to learn about this one tonight, so thanks a million for putting it here. Gosh. How in the world am I ever going to be so up to date as to learn about these exhibitions and catalogues either just before they open, or at best during the year of their run? I’m interested in obtaining the catalogue, but I can’t find a seller in USA with a copy. I might try getting it through interlibrary loan first, just to make sure that I need to part with the equivalent of DKK 299 (about $54) and shipping from Statens Museum in Denmark. With your recommendation, I’ll push for it a little harder. Are there any framed works included by Agnes Slott-Møller and her husband Harald? I’m glad that you enjoyed the Ortega y Gasset essay; the book is a good one, and has very interesting pieces on frames in the royal collections, frames in the royal palaces, the work of the C19 court gilder and C19 artists’ frames, including the Slott-Møllers and Willumsen. I’m going to republish all those, which is a tremendous piece of luck, kindness and generosity on behalf of Henrik and the Statens Museum. Hi, Lynn. We’re deep into winter weather here. In fact, we’ve much more snow on the ground than we’ve ever before seen in our 20 years living in this tiny town of Kirby, Wyoming. Temperatures have plummeted to 12 below zero and we’re guaranteed to see it a bit beyond 20 below zero tonight. YIKES! Well, it won’t stay quite that cold for too long, anyway. Hope you are warm and cozy over there. I’ve just received the first bad news email I had hoped I wouldn’t get regarding availability of FRAMES: STATE OF THE ART. Three weeks ago I emailed Statens Museum about the book and did not get a reply in my Inbox. So last night I scanned the bookstore page on their website and discovered they have a bookseller, Arnold Busck, who handles online sales for them. And with that I quickly queried the bookseller, and seven hours later (30 minutes ago) received a reply note from the bookseller quickly informing me they are SOLD OUT. I didn’t ask if they had a Danish edition since I’m not quite ready to settle for one, but they didn’t mention having one, either. If you encounter an available copy of the English edition, I’d love the opportunity to purchase it. If you have a lead on a seller or other possible connection, please tell. One problem for me, of course, would be if the price for it has skyrocketed. I’ll continue hoping not whilst hoping that I’ll soon obtain my very own copy. And now, congratulations on your recent Picture Framing Magazine by-line with the William Holman Hunt “Style Snapshot” feature. I am delighted to read you there. WOOHOO! I’ll email you about the Danish cat. Thank you for the nice comment on the ‘Style Snapshot’; I was pleased to be invited to contribute – although I have only seen the pdf of it.